DESCRIPTION HOME SWEET HOME! Welcome to "The Kensington". This well maintained, well-managed building is ideally located, set back from historic Memorial Drive by a quiet, tree-lined park & just steps from the Bow River! 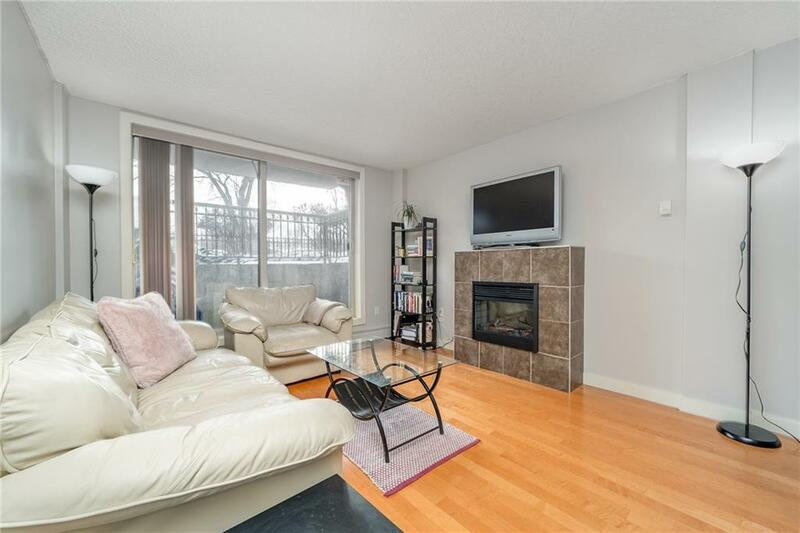 Inside, this highly functional one-bedroom condo features a bright, open living area, large south facing windows, a private patio, hardwood floors and a built-in desk, perfect for professionals. The galley kitchen boasts granite countertops, stainless steel appliances, & a full pantry. The 4 piece bathroom features a massive corner soaker tub/shower & additional storage. As a bonus, this unit comes complete with in-suite laundry and a private parking stall in the back. (It also qualifies for 2 free residential parking permits!) Experience the best of Kensington living, located one block from trendy restaurants, shops & a recreational pathway system, this building is also pet-friendly (board approval) with low condo fees! The perfect home for first-time buyers, inner city professionals & investors!